Why should teachers join Chicago's librarians in calling the Mayor's Office on February 6? Teachers aren't the only public servants Chicago Mayor Rahm Emanuel has been trying to bully in his foul way. He's also been trying to blame the city's librarians for what he calls our "tight" times financially — while continuing to provide millions of dollars in pinstripe patronage for his lawyer and bond broker cronies, and even more in TIF and other tax handouts to corporate Chicago. Call the Mayor's Office at 312-744-3300. Rahm Emanuel has declared war on the city's teachers and librarians (and other public workers) while starting an unprecedented era of pinstripe patronage and crony capitalism for corporations, big law firms, and the city's millionaires and billionaires. Substance photo taken at the September 8, 2011 meeting of the Chicago City Council by George N. Schmidt.Who would have thought — ever — that a Chicago "Democrat" would launch attacks on public school teachers and those who work at our public libraries. Until the Reign of Rahm, the whole notion would have been laughable. But with the help of the city's corporate media, he's been on what Substance has called a "Rahmpage" against teachers and librarians. Please call the Mayor's Office at 312-744-3300. Today, February 6, 2012, the librarians are fighting back. Their union (Council 31 of AFSCME) is asking everyone to call the mayor's office. Tell him to open the libraries all day on Mondays and stop trashing and bashing librarians (and while you're on the phone, teachers, too). Chicago's public librarians and their union are asking everyone to call the Mayor's Office at 312-744-3300. 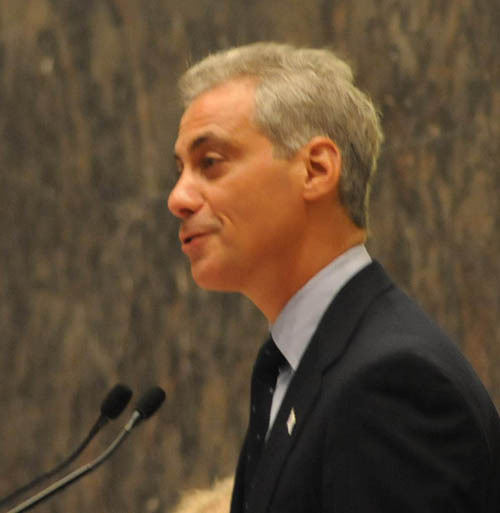 Is Rahm's magic carpet media honeymoon finally over? As most readers of Substance know, since some of our colleagues in the corporate media caught up with our Substance stories about the Rahm Emanuel "Rent A Preacher" and "Rent A Protest" stories two weeks ago, Rahm's been dodging real reporters and hiding from most of the media. He just announced the same thing for today, probably worried that some reporter is going to ask him a question about why he's been trashing teachers and public libraries, when Chicago's poorest children and families need more of both. "Call the Mayor's Office at 312-744-3300. "Tell him: You've come part of the way, now please finish the job. Open our libraries all day on Mondays. Restore all library hours, services and staff. "Libraries are at the heart of our communities. But Mayor Emanuel's budget cut library hours and staff. Responding to public outcry, the Mayor restored some hours and staff — a step in the right direction — but libraries will still be closed Monday mornings and short more than 100 staff. "Now we need to urge the mayor to finish the job! Only $1 million in funding (a tiny fraction of the city budget) is needed to fully restore library hours and staff. "The mayor recently announced that he was providing $3.7 million in TIF funds to a commercial animal-testing laboratory to help keep 26 jobs in Chicago. Yet for just a third of that amount, he could save more than 100 libeary jobs — many of them library pages who work part-time for very low wages. And he would achieve a much greater social good — preserving our public libraries."